The Making of Mexican Modernism features prints and paintings from the late 1800s to the 1960s by some of Mexico’s most significant modern artists. Folk culture, high art and political consciousness influenced their art making; each of these artists contributed to the development of modern Mexican cultural identity. Modern Expressions of Figure and Form showcases modern art works in a range of media, techniques, and styles, highlighting depictions of the human form among the holdings of our permanent collection. ROUND TRIP: Eight East Los Angeles College Alumni Artists unites a cross-section of renowned visual artists whose artistic careers originated in East LA. ROUND TRIP presents approximately 80 artworks made by 8 artists Diane Gamboa, Gronk, Clement Hanami, Will Herrón III, Judithe Hernández, Kent Twitchell, John Valadez, and Patssi Valdez. Each artist is featured in a mini-retrospective format with a spectrum work produced over the last thirty years. Range of media includes painting, drawing, installation, photography and video. A full-color, 48-page catalog with essay by writer and ELAC alumnus Max Benavidez accompanies the show. 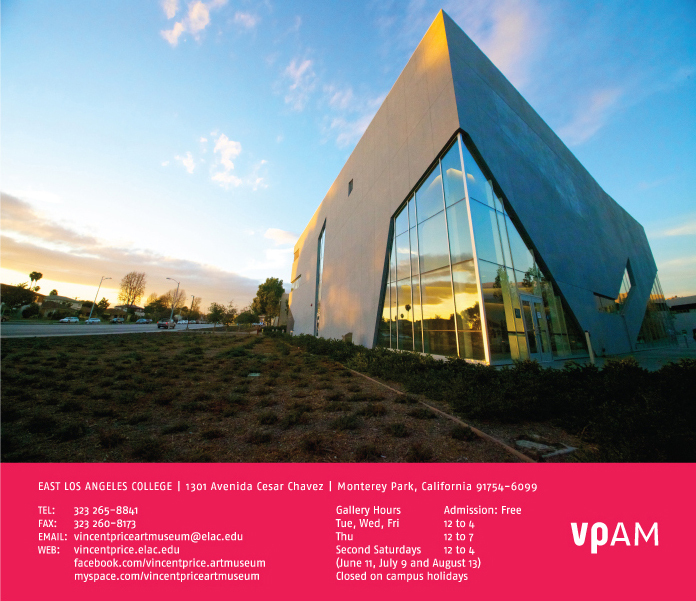 VPAM proudly presents the 2011 Juried Student Art Exhibition. In order to meet eligibility, a student must have taken a course in studio art, architecture or photography at ELAC within the last two academic years. Each student may submit up to three pieces for consideration. Our 2011 distinguished juror is artist Phyllis Green. Green’s work was recently featured in a 25-year solo retrospective at the Ben Maltz Gallery at Otis College of Art & Design. Juror’s prizes will be made public at the opening reception on Saturday, May 21, 6 to 8 p.m.
Los Angeles-based artist Sonia Romero inaugurates VPAM’s Hoy Space, a gallery featuring emerging artists whose work addresses current and active topics. Romero’s installation entitled “Inner Landscape” will incorporate paper cuts, felt sculptures, painting, and block printing. In this new body of work, the artist offers multiple perspectives on consumption and overabundance in American daily life. This entry was posted in art, East Los, Eastside, Events, Gente, history and tagged art, ELAC, vincent price by El Random Hero. Bookmark the permalink.